The breath of Mother Earth is called sah-laugh-woun. It’s the most beautiful word in our language. When I go up to the mountain and the gentle breeze kisses the trees, it’s sah-laugh-woun. When I visit a waterfall and feel the cool mist, it’s the breath of the waterfall. I’ve always loved that, because everything has its breath. The breath of life of Mother Nature. The breath of life of water. The breath of life of our first born. If we’re lucky, we’re sitting close by and listening for it with our third ear. When it comes from the water we say, “Aaah, I understand.” Or from a tree as the wind slowly draws up the valley and touches its boughs. They wave to the drumbeat of their own music, and we hear it for the first time and think, “Aaah, the sah-laugh-wounof the cedar. I understand. I’m very honored that I can hear you speaking with your husband, your child, your relatives. Our Creator, Kha’als, gave us our Indian land — the sacred land of our ancestors. It’s tcha-lang-an,“our way of life.” Every morning, we go up in the mountains and swim. And as we go, we talk and pray to the four directions and the four colors of the universe: black, red, yellow and white, the colors of the four races. At daybreak, in the icy mountain creeks, river, waterfalls and springs, we cleanse ourselves of yesterday and prepare for today. When we have dancers in our longhouse during the Pow Wow season, November through April, we take them up for a swim every morning. When I was first old enough to open up my eyes, in other words, when I first received a memory, my grandmother used to take us down to the river to bathe. While we were sitting there drying, she would tell us stories of our connection to the land and the universe and how everything was formed. I was raised at the foot of Mt. Baker. When I was still very young, we moved to the Olympic Peninsula. I grew up along the river. There were no roads, and we had to go in and out by canoe. We had no electricity. But there was always the water…and the old people who taught us about our connection to Mother Earth. When I was initiated into our longhouse, I found out all the things I thoughtI knew were just stairsteps leading to a door. The door opened for me during that initiation. It was a very spiritual experience that lasted from November to April. It connected me with myself. A person has to connect with himself before he can connect with anything else. A lot of people go out and try to connect with Earth when they haven’t even made a connection with themselves. So I made that connection with myself. And I learned that I was all right. Then my third eye opened and I could see into the spiritual world of Nature. And my third ear opened, and I could hear the things that I needed to hear from Nature: where all people came from in the beginning. Listening with my third ear, watching with my third eye and speaking with my second mouth, I connected with Nature — all the animals, treelife, all living things. Inititation opened our eyes to see that absolutely nothing could be taken for granted. Our elders fed us when theywere ready. They took us to the bathroom when theyfelt we should go. At one point the understanding came, and we had to retrain ourselves. Throughout initiation, there were people who watched over us They took us up to the mountain every day. There we would fast…and swim…and run…and fast…and swim…and run…up the mountain…going…going until we received the answer that we were searching for. Any elder — not just a grandparent — was our elder. They would sit us down and we knew just what was expected of us. At a tender age we knew that when we attended a gathering, were to go to the back row, sit down and behave ourselves. Instead of asking lots of questions, we learned to listen and watch. My grandmother used to say that if people were meant to speak more than to listen, they would have had two mouths instead of two ears. After initiation we had to be quiet for three more years. Not until we were four winters old were we allowed to go onto the smokehouse floor and talk. That time was to study our selves and our environment…to understand what we experienced that winter. It’s an interesting way to learn about life. I learned enough from my elders to get up that staircase. Once I got to the top of the stairs did I learn to listen to Nature, and that opened the door to everything else. All my life I’ve studied plants. When I was very young, my grandmother would take me into the woods and teach me about herbs and which plants make medicine. Because my birthday is in December, I was too young to start school with all the other kids. They would disappear every day, and I’d follow Grandma around. She’d take me from plant to plant, calling them by their Indian names, teaching me what parts to use for different kinds of medicine. When she passed away, I learned from other people, plus I learned from Nature…by fasting and asking the plants how to use them. Over the years I’ve collected knowledge of almost every plant, how to use it, what time of year to gather it. A lot of people say, “Then you’re a medicine man.” “Medicine man” means many different things in Indian country, and it conjurs up all kinds of images in the minds of non-Indians, including witch doctor. In white-man’s language, you’d call me a botanist rather than a medicine man. In time, I also learned how to make clothing, baskets and carve masks from the different parts of the tree. The tree will tell me the things I need to know. What it says depends on what I’m searching for. If anyone goes to it with a good mind and good heart, the two will become one. The only time you achieve harmony is when your heart and mind have become one. In other words, you have total and complete understanding. Not only of yourself, but also of your environment, what you want to listen to. Say, today I’m going to carve a mask. I go and I sit by a tree, meditate and talk with this tree. Soon, its bark moves aside, like a curtain on a stage, exposing the grain. Behind that curtain there are many things going on. But this day I’m there only as a carver. There in the grain will be the vision of my mask. And the grain will show me how big to carve the eyes, the mouth. At my house I have almost everything in dried form that’s in the mountains: the seeds, the bark, all the different types of plants. We use them for tea and for different medicines. I didn’t grow old because I amthe best. I grew old because I didthe best I could with what I had to work with. Times were changing. Few people today, including Indians, have the connection they once had to Nature. Now that we have conventional jobs to pay the rent, or mortgage, lights and other bills, we can’t live the way we used to. It isn’t possible to dedicate the time we did not so long go to traditional practices. In the old days, keeping a tradition alive was an everyday thing. Most of the places where we used to practice our beliefs don’t even exist anymore. They’re gone. They’ve been turned up, rolled over, developed. In their place are ballparks, housing projects and shopping centers. Preserving tradition means nurturing it. It’s like having a Volkswagen. If something goes wrong with it, you don’t take it to a Cadillac dealer, you take it to a Volkswagen dealer. It’s still a car, but there are certain places you go to fix it. It’s the same with our spirit. Each of us is an individual, and we each have a different kind of power. To “repair” it or to nourish it along, we have to go to the source of that power. If that particular place no longer exists, we have to go in search of another. We shouldn’t have to do that. It would be like me going to a white people’s church every Saturday night, dragging it off some place and letting them try to find it on Sunday morning. Or going in and taking a silver chalice off the altar and replacing it with a styrofoam cup. They both hold fluid. But one has been blessed and is sacred the other one hasn’t. Recognizing a sacred place involves awakening a sense every race possesses. No matter what kind of initiation different races go through, they are waking up the same thing. Once it’s awake, itknows when we come to a sacred place, and itlets usknow. Then we are aware the place possesses power for swimming, or for knowledge, or for fasting and questing. In such a place we can meditate and release to Mother Earth all the things we don’t need to carry around with us. She’ll accept them and heal us and make us stronger. For some places that are meaningful for our people, it’s too late. There are still sacred places left, but they are increasingly further and further from home. When winter is upon us and there’s snow on the ground, it’s treacherous to travel so far to keep our practices. Today, we have to drive 65 miles from the Lummi Reservation to the nearest sacred pool in the mountains; and it’s the same distance to our fasting and questing places. 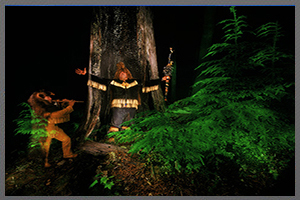 The places the timber industry are clear cutting are the places our ancestors have been using for traditional practices or ceremonies for thousands of years…places we use today, until they are destroyed. We try to explain that to the people who are logging them. We tell the corporations and government we have a right to determine how the land is used. We still consider ourselves the landlords of this place. Lummi people have been offered money for the land, but we’ve turned it down. We ask, “How can anyone own the land, the rivers, or the trees?” If you die, you can’t put it them your grave with you. You can only put into your grave what belongs to you. I don’t know how they can put mountains, rivers, valleys, waterfalls, lakes, old-growth timber and all the medicine plants into the grave with them. They can’t. So it’s not theirs. We’re not saying it’s ours,we’re saying it belongs to the people,to allthe people, and the land should be left as is. Because one day my great grandchildren will have to go to the library to look at pictures of old-growth timber. As it is, we have to go there now to look up the ways of our old people. We have to read it in books and see pictures of the old gear, because in 1930 the government came in and made our old people destroy all their ceremonial objects. Battle shirts, cedar hats and carved masks, anything that pertained to our belief, they called religion. We have no religion in Indian country. There’s spiritualism. But no religion. Religion was introduced to our people. Our way of life was disrupted when non-Indian religion tried to replace our spiritualism. If people believed all life is sacred, they wouldn’t destroy the land, water and air. Religion only believes in the goodness of certain things that the Creator made and not the sacredness of all things. Certainly not the equality of all things. Ironically, for five hundred years, Indian people have been struggling to exercise the same freedom of “religion” that brought Europeans here in the first place. Man is notsupreme over all things. Women are the only ones who are supreme over everything, because they are the only ones who can perform the miracle of birth. Therefore, they are very precious. In Indian country there is a saying that when a woman marries an Indian man she must walk ten paces behind him. Non-Indians misunderstand. It is not a matter of superiority. We wantto walk in front of our women to protect them from anything that may lie ahead because they are the miracle maker. Women are very special…all over the world. They are the ones who carry the ceremony and teach tradition. They are the ones who remember the legends…the creation stories…that are told to the children. They are the “experts.” They are the ones who help shape our vision of creation and our relationship to it; and they are the ones who teach us to take from it only what we need. As we grow, we start seeing the abundance of life…. In the winter, we watch the snow fly and the brooks freeze. In the springtime, we wait as the snowmelt seeps into the Earth and new growth emerges as flowers and then, later, as berries. Earth teaches us about cycles. Season after season, she keeps producing. We call Earth our Mother because she’s like our women. She keeps giving over and over and over and never says “no.” She’ll give us everything that we need: medicine, food or water to cleanse and heal ourselves spiritually, mentally and physically. We begin to see how perfect it is. The Creator made everything perfect. Imperfection came in man’s misuse of the two minds the Creator gave us: one to think with, the other — our heart — to feel with. We are educated to use only our minds and not our hearts. I’m not saying education is not good, but it’s not enough. Spiritualism has to be re-introduced in the system. I don’t mean religion. I mean spiritualism— the spirit of the land…the spirit of our mothers…the spirit of respect for our elders…. But the most important lesson education needs to teach is respect for self. All people need to learn how to love themselves before they can love anyone else. They can’t give away what they don’t own. Indian children are being taught by the non-Indian community…from the book…not from the heart. That kind of education hasn’t taught them about the Earth as Mother. When children go on a field trip, it really stands out in their minds…catching little pollywogs and frogs…seeing the dragonflies…. Intuitively, they relate to their natural environment, even if that sense has been suppressed. When we go up in the mountains and swim in the cold, rushing stream, we’re getting rid of positive ions and collecting negative ions from the water. A child instinctively knows it needs negative ions. Turn any child loose near a mudpuddle, and the child will discover it and jump up and down in it, collecting negative ions. Children who are bathed with the parents in the mountain streams are more calm, they’re less fussy and cry less than other children. Wherever there’s a fountain you find people are not only sitting next to it, but they’re also throwing offerings into it. Even though there are very few negative ions coming from the movement of that water, people recognize it. It’s instinct to thank the water because it’s giving them something. When Indians wish to thank the spirits of nature, we offer food. Something is going to eat that food: the water people, frogs, fish, salamanders, lizards, whatever might be in the water. Or something will come down to the water’s edge for a drink. Maybe a bear, deer, elk, or a moose, bobcat or raccoon. Something will eat that food. If we’re very lucky, our food offering will make it all the way down the river system to the salt water, and a sea gull will eat it. Then we will receive a good, strong voice like the sea gull. We pray that anything that shares our food will give us some of its power and wisdom. When we’re given food, we’re only allowed to eat half. The other half we save and take up to the mountain when we go swimming. If I’m in my office or some other place and I get overloaded — mentally, spiritually, physically — I’ll lean back in my chair and I’ll go into my spiritual workshop. I’ll put myself mentally in some very beautiful place, like Thompson Creek or Wells Creek. Then I’ll put myself there physically. I’ll see the little mountain heather, smell the mountain azalea, honeysuckle, fir trees, cedar trees, the blackberries and blueberries — all that aroma rolled into one — and feel a soft breeze blowing on me. And I’ll see the snow-capped mountain…the eagle soaring above the valley…the mountain wolves dancing playfully across the valley. And I’ll hear the coyotes’ cries echo off the walls around the valley…and I lean back and send my cry with them. I teach this to Indians and non-Indians. First, so they have a powerful place to visualize, I take them to Wells Creek. No matter which side of the mountain I take them, they say, “Aaah. It’s breathtaking.” …the waterfall coming off Perimeter Mountain…mountain goats bouncing between the waterfalls…another waterfall coming right out of Mt. Baker — right out of the snow…it runs into other falls that run into Wells Creek. They begin to feel the old growth forests all around them, see the eagles soar. I take people to the mountain-fresh air of the meadow and they can see all this at one time and feel it all at one time and hear it all at one time. Then I ask them to lay back on the ground and feel Mother Earth and listen for the drum beat. That’s what our drum represents, the heartbeat of Mother Earth. Then I’ll join that beat and start pounding my drum. I let them feel it all and it gives them understanding. I introduce them to our tcha-lang-anand tell them this is not meant for any one person to own. It’s something that everyone should see and experience. It’s our way of life…and the way of life for all our brothers and sisters on the face of the Earth. I bring all kinds of people — legislators, business people, people from all different countries: Saudi Arabia, Africa, South America, Japan, Switzerland, even Germany and Russia — to the mountain for the day. Some come away understanding what it is we’re trying to do and why we’re trying to do it. Yes, it’s very sacred ground. We can’t say that one parcel of land is any more sacred than any other. The land is like us. Each of us has a special gift, and when we put all those special gifts in one place, we have a community. Not just acommunity, but a strongcommunity — a whole. It’s like taking a bundle of kindling. When we take one stick out, we can snap it easily. But we can’t snap the whole bundle, because when we put the individual pieces together, they’re very strong. That’s the way people are. If we become part of one community and each of us has a gift, then we’re very, very powerful. If there’s a weak link, then it’s up to the community to make that link as strong as the rest of the community. Many people who are feeling the pinch of an overdeveloped, overpopulated environment are moving to Washington. Here they feel closer to Nature. But they come in and clear away the forests, and the process begins again. They create the same thing they’re running away from. There has to be a reconnecting, a new consciousness about Earth. Everyone needs to understand. If you destroy the land and the timber and the water, then you have destroyed our culture. If you destroy our culture, then you have killed our tradition. If you kill our tradition, then you have wiped out the Indian. At the rate we’re going, our children will have no idea what Indian tradition and culture are.